Need help reading or listening to Dewis Cymru? 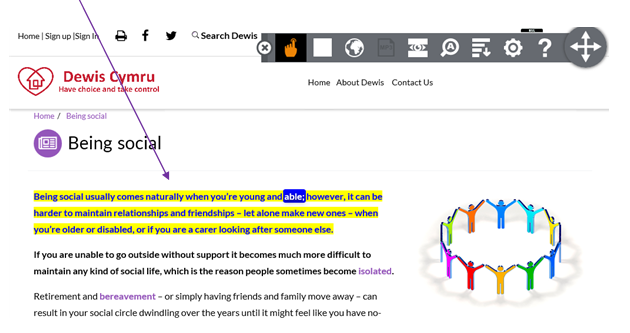 As part of our commitment to make Dewis Cymru as accessible as we can, we’ve added something called Browsealoud, which helps people who might find it difficult to read the information on Dewis Cymru. This might include people with dyslexia, people with literacy difficulties, people for whom English is not their first language, or people with mild visual impairments. It works on smartphones, tablets, PCs and Macs. All the things Browsealoud can do are controlled by these symbols. Browsealoud reads website content out loud in a high quality, human-sounding voice. No matter what page of the website you are on, just click on the pointing finger in the grey menu bar, and Browsealoud will start reading that page to you, and it will highlight the text it’s reading. Or, if you prefer, you can use your mouse pointer to highlight some text, then click on the triangle and Browsealoud will just read that bit of text. 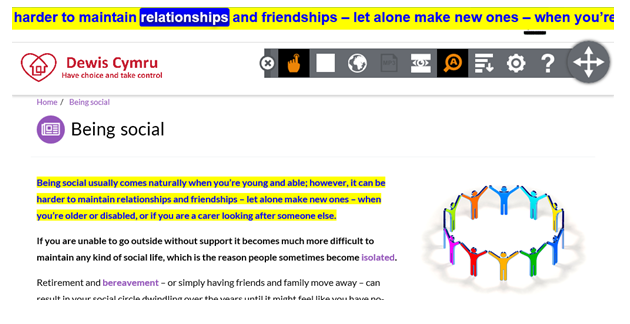 Dewis Cymru includes lots of links to other websites, to help people find the information they need as easily as possible. However, if you’re using Dewis Cymru with Browsealoud and you use a link to get to another website, Browsealoud will not be able to translate or read that website to you. If you want to read Dewis Cymru in a different language, click on the planet Earth logo and select the language you want. There are over 70 to choose from! When you move to a different page, the language may go back to English at first. But Browsealoud will translate it into the language you’ve selected within seconds! Browsealoud can translate text into over 70 other languages. For over 30 of these, Browsealoud can read the translated text to you as well! Just select the language you want then follow the instructions detailed in 'Getting Browsealoud to read the site to me'. Browsealoud translation is available in a number of languages as shown below. We’ve worked hard to make the appearance of Dewis as simple and clutter-free as we can. But we understand some people will still find it a bit too cluttered. So Browsealoud has two tools that can help. Then you can move your mouse pointer down the screen and it’ll make the bit you’re reading stand out more. If this doesn’t help, you can also try ‘simplify’. This removes all graphics, pictures, and colour, so that you just see the words, in black and white. You can change the colour of the text or make the text bigger so that it’s easier to read. The guidance above has been produced by the Dewis Cymru Team, and tries to provide simple instructions about how to use the main features of Dewis Cymru. If you’d like more information about Dewis Cymru then please visit ‘About Dewis’ or if you have a question please get in touch by using the ‘Contact us’ button on the homepage.